So often people think of the dark ripe pu-erhs with their strong musty earthy aromas and smooth flavors and forget about a truly collector’s tea: white pu-erh. Time to stop and take a moment to see what you’re missing. 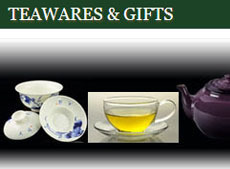 Pu-erhs generally come from the high mountain tea plantations in the Yunnan Province in China, although a few have popped up from other areas. The Chinese White Pu-erh is a Sheng Pu-erh and has only been around since the early 2000s. 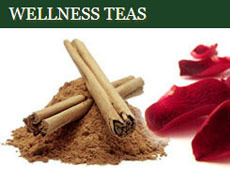 It is made exclusively from the topmost and tenderest buds of the tea plant Camellia Sinensis. The Jinggu Large Leaf Arbor Cultivar is often used, and the harvesting (two leaves and a bud with their shiny downy coat are plucked in the Spring) and processing are done exclusively by hand. 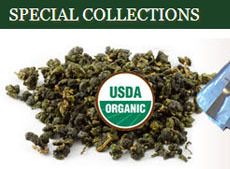 This is, therefore, one of those limited production teas, commanding a higher price. But that’s not all that makes it so special. White pu-erh tea undergoes the same procedure of fermentation, drying, aging, and compressing as other Pu-erhs, but these steps last a shorter period. They are all done by hand, and the full procedure is incredibly labor intensive. First the tea is naturally withered and then sun dried. Next, the tea is piled onto a large table and sorted to assure no defective buds remain. Then the tea is steamed again to make it soft and pliable for the forming stage where the lightly dampened tea is formed under pressure. The cakes usually weigh about 40-50 grams. They are placed on racks and dried during the next 5 to 7 days at 45°C while the moisture in the tea buds continues to ferment and thus add depth and body to the tea’s already distinctive character. A knife is needed to pry large horizontal flakes of tea off the cake for brewing. Steeping in a tall glass is a good way to enjoy this tea. Warm the glass first with hot water. Then, add about 2 grams of tea buds to the glass and add boiling water about one-third full, letting the leaves absorb some of the water. Let steep about a minute and then add more hot water to fill the glass. Let steep for 2-3 minutes. You should be able to get about four flavorful infusion from the same buds. White pu-erh is characterized by a light and delicately sweet taste, one to enjoy in delicate sips rather than big mouthfuls. The color of infused tea is light and the flavor is gentle with a refreshing character. Store away from moisture and sunlight. Some claim that the tea gets better with aging, that like green Pu-erh more complex and powerful characteristics will emerge and elevate the tea to a truly heavenly experience. 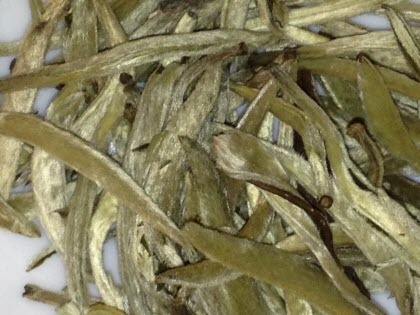 Others say that the delicate and light character of White Pu-erh is not suited for long term storage, that its character will quickly fade to a bland and tasteless tea. The tea hasn’t been around long enough to know which of these theories is correct. 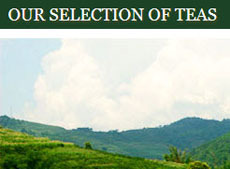 This entry was posted in For Pu-erh Devotees, White Teas and tagged chinese tea, JAS-eTea, Pu-erh Teas, White Teas. Bookmark the permalink.